Industry professionals weigh in on the challenges and opportunities of marrying clinical and billing documentation in EMRs. The foundational objective of any clinical documentation improvement (CDI) program is to produce the most complete and accurate documentation possible. It seems a reasonable goal, yet the industry at large continues to struggle with achieving a balanced documentation product that adequately supports both billing and clinical information needs. Widespread use of EMRs provides an effective way of collecting data, but it also introduces challenges, according to Mark Morsch, vice president of technology with Optum. "While the EMR has provided numerous benefits to the health care market, the goal of improved documentation and automated coding derived from that documentation has not yet been fully realized," he says. "One of the biggest challenges is quantity of information vs quality. With electronic records, it is common to have extensive content and data where quantity is trumping quality." In addition, health care organizations can become misguided with their CDI strategies, tilting the scale too far in the direction of optimal reimbursement, says Jon Elion, MD, FACC, president and CEO of ChartWise Medical Systems. "Some hospitals got a little excited and found that they could have an opportunity with coaching and creativity to game the system," he says, pointing out that these practices not only result in the potential for negative newspaper headlines but they also do not align with the paradigm shift from fee for service to value and quality. Value-based care and the emergence of multiple reimbursement methodologies exacerbates the problem of increased documentation requirements, Morsch says, increasing physician clamor about problematic EMR workflows and the need to focus more on patient care. "Rather than causing further physician disruption or requiring physicians to become revenue cycle experts, the common denominator in this equation must be accurate documentation that is reflective of patient acuity, the medical necessity of the care provided, and the quality of care the patient received," he says. "This not only ensures the documentation can support the complexity of the revenue cycle but also provides better communication amongst providers and benefits the most important part of the health system—the patient." While the right equation continues to elude the industry at large, Elion says a proper balance exists. "You are supposed to have the most complete chart you can," he says, pointing to consistent guidance handed down from regulatory and accreditation organizations. The key is finding an equilibrium that addresses all the data needed for billing and reporting, while maintaining the quality of the physician note. While HIT has introduced ways of collecting and aggregating sizeable amounts of information, industry professionals suggest that key data elements are often missing or hard to find. "EMRs have really made it difficult for physicians to communicate their patient care," says Glenn Krauss, BBA, RHIA, CCS, CCS-P, president of Core CDI and creator and founder of Core-CDI.com. "It's not aligned with how they think clinically; it interrupts their thought processes and, unfortunately, it's the patient who suffers. Downstream, the coding and billing suffers." Krauss explains that EMRs have inadvertently created more work for physicians. "I see physicians sitting in front of their computer and they are pointing and clicking and dealing with drop-down menus," he says, adding that the way templates are structured in the EMR can hinder data entry workflows and impact the manner in which a diagnosis is entered. "The EMR was not designed by clinicians. Clinicians have no say in how it's populated." "Electronic health records should be leveraged for what they can do to improve care and documentation, including effectively displaying prior information that shows historical information in rich context, supporting critical thinking, enabling efficient and effective documentation, and supporting appropriate and secure sharing of useful and usable information with others, including patients, families, and caregivers. These features are unlikely to be optimized as long as the format and content of clinical documentation are primarily based on coding and other regulatory requirements. Furthermore, under these circumstances, EHRs lose much of their potential to improve care and documentation and instead are relegated to doing nothing that could not be done with paper records—only less efficiently." Unfortunately, Krauss believes that electronic patient records are predominately data repositories for the submission of quality measures with little focus on communicating patient care. Elion, also a board-certified, practicing cardiologist, compares physician use of EMRs to a pilot in the cockpit of a 747. "[Physicians] are surrounded by gauges, instruments, lights, and switches. It's all complete, but dang, it can be difficult to navigate around," he says. "It's very possible to write a note that is technically correct but is useless to the reader. Physicians can fill up a giant note but really haven't written anything. Copy and paste within EMRs propagates errors." Offering an example, Elion points to a physician referencing "K 2.3" in a chart, a reference to low potassium levels that most clinicians would recognize. "Every physician will know what that means, but coding departments cannot code properly from that. I have to use the word 'hypokalemia,' which means low potassium," he says. In another example, Elion points out that coders often cannot use documentation from other clinicians to support a documentation code. If a radiologist provides a detailed description of a fractured hip but the physician does not specifically call out how and where the fracture occurred, coders cannot include the needed specificity for the highest reimbursement. 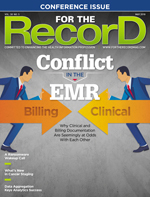 Morsch says that coded data embedded within an EMR may not fully reflect the coding guidelines required for billing, such as combination codes, symptom-of relationships, and code specificity, which can lead to a disconnect between final coding for billing and the documentation. "A smooth billing process is contingent upon accurate coding, so this disconnect can cause delays, requiring additional time and effort to review the documentation and ensure accurate coding," he notes. Morsch adds that the current structure and quantity of EMR data creates challenges for clinicians and administrative staff who need to quickly read and interpret medical records to support patient care and revenue cycle activities. He says that "care provider organizations are experiencing increased scrutiny from health plans as they more closely review documentation for clinical justification for diagnoses, treatment decisions, and coding selection, as well as denials and rework as a result of their attempt to use technology to auto-capture coding within the EMR as a replacement for coding professionals." Krauss says current EMR documentation practices introduce notable risks in the form of overdocumentation or hyperdocumentation that is perpetuated by cut and paste. "Cut and paste is out of control and dangerous for patient safety," he cautions. "The other notable risk is overdocumentation that leads to overcoding. But the real issue is that the clinical facts, information, and context is not in the chart. How do you defend a diagnosis with information that is not there?" While health care organizations can unintentionally engage in overcoding within the parameters of EMR documentation, Elion points out that some CDI practices have also been overly "creative," resulting in notable consequences. In one well-publicized incident, a small hospital in rural northern California claimed to have treated 1,030 kwashiorkor cases—18% of the organization's patients—over a two-year period. A severe form of malnutrition, kwashiorkor is most often seen in children who come from areas where severe starvation is common, such as Africa. It is rarely seen in the United States. "I have never seen a case of kwashiorkor," Elion says. Notably, kwashiorkor brings with it an increased reimbursement of more than $11,000 per patient. With little documentation to support the diagnosis, it was a case of blatant upcoding, Elion says. "They got caught because of an algorithmic audit—they were an outlier," he says. In less obvious cases, hospitals can get into trouble for documentation practices that appear to exist solely for the purpose of getting paid. Sepsis is a prime example. Defined as a life-threatening condition that arises when the body's response to infection causes injury to its own tissue and organs, sepsis can carry common symptoms such as fever, but it's often accompanied by other more serious symptoms. In one case, a hospital had a 33% incidence of sepsis, which, when not acquired during a hospital stay, carries a higher level of reimbursement. "You can do this in a compliant way," Elion suggests. "Compliance officers often fuss about this because they don't want to be in the headlines." Many industry professionals believe that continued education and training of CDI professionals and physicians can go a long way toward improving the documentation outlook. "One opportunity is for us CDI people to become more knowledgeable about what is a good note, what is a good H&P," Krauss says. "We could help improve the quality of the documentation. We cannot change the workflow process, but we can help develop better templates." Krauss suggests that templates are designed to primarily address billing needs as opposed to communicating care. "We need to be physician advocates," he says. "All we do is use physicians as targets of queries. The fundamentals of documentation should be evaluation management. Evaluation management is the exchange of clinically reasonable and necessary information between doctor and patient and other health care providers and nurses, and the use of information and management of the patient." Elion emphasizes the need for better physician education. "If [the physician] note in the chart is so important, why aren't they teaching this in medical school?" he asks, noting that a gap remains between the way physicians want to talk and what coders need to hear. "You can train physicians to be better at it." Elion suggests there are two words that physicians should use to make their notes infinitely better: "due to." For example, a note should read that a patient "has anemia due to a GI bleed." Otherwise, if a physician documents only that a patient is anemic, the coder has no idea it's associated with a bleed. Additionally, Elion recommends CDI specialists limit the use of "unspecified codes," which typically exist due to a lack of specificity in the patient note. "Doctors need a report card on this," he says, pointing out that there are more than 9,000 unspecified diagnoses in ICD-10. "Specificity is critical for new reimbursement models." Concurrent documentation practices that ensure CDI specialists are tracking and identifying potential issues before a patient leaves the hospital continue to be among the best solutions employed by hospitals, Elion says. "I want to see doctors uncoupled from the coding. We want to produce documentation that is coder friendly, that captures everything we can possibly capture," he says. Many health care organizations are turning to HIT solutions to automate and speed the documentation process, according to Morsch, who cautions against becoming overreliant on these tools. "While solutions like customizable clinical documentation templates in EMRs have streamlined the structure and completion of a patient's history and physical exam, it can become easy to rely on the template and overlook the clinical clarity of the patient story," he says. "A high-performing health system includes not only a well-functioning revenue cycle but, more importantly, the consistent delivery of quality care to patients. For care providers whose priority and expertise are their patients and providing quality medical care, when it comes to documentation their focus is on accurately recording that care. When this is done well, it directly feeds into the documentation required for billing purposes." Morsch says the greatest risk associated with documentation challenges is "to do nothing." He adds that technology should focus on driving the accuracy of documentation as close to the point of care as possible, potentially reshaping the traditional revenue cycle and better positioning health care organizations to bridge the gap between fee-for-service and fee-for-value models. "Accurate documentation supports accurate coding, helping to ensure appropriate payment and accurate quality scoring," he says, adding that artificial intelligence and natural language processing can provide feedback and corrective action at the point of care. "In addition, a proactive approach to ensuring accuracy can reduce costly rework and denials, improve cash flow, and promote information integrity."